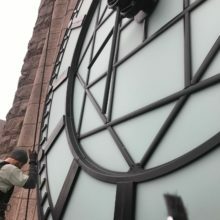 Americlock provided much-needed restoration and repair to the four-faced chiming clock sitting atop the Historic Minneapolis City Hall and Hennepin County Courthouse building. The historic building, also known as simply the Municipal Building, was designed in the Richardsonian Romanesque style by architects Franklin B. Long and Frederick Kees in 1881 and was finally finished by builders Charles F. Haglin and Charles Morse in 1909. In 1949, when the original glass faces began to crack, metal faces with neon lighting were installed. 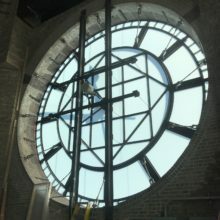 Keeping the historical significance of the landmark and its chiming clock in mind, Americlock worked closely with officials from both Hennepin County and the city of Minneapolis to complete this nearly $2.1 million restoration project which started in July 2016 and ended in April 2017. The months-long project formally began with the designing of the clock’s mold using AutoCAD software. 60 clock castings were then poured at Arkansas-based foundry Southern Cast Products and, at nearly 1.5 tons each, 12 of the 60 castings were tested and x-rayed. After determining the tolerances of the castings, Americlock’s team of clock installation experts traveled to chilly Minneapolis in the dead of winter to begin the rebuild. Swing stage scaffolding, 350 ft. high in the air, was used to work on the front of each clock face. 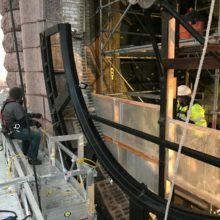 The Americlock team installed the castings while overlook U.S. Bank Stadium. Each clock face weighed close to 12,000 lbs. The largest pieces of glass weighed 150 lbs. The team had to first remove the rusted white enamel sheet metal and red neon-lit hands on each clock face before they could install the new castings. Each clock hand was then shipped back to St. Louis to remove the neon lights as well as to sandblast, prime and paint each hand. Using swing stage and inside scaffolding at a height of 350 feet, it took at least 6 men to install each casting. Every casting was milled to accept custom extruded silicon gaskets for the glass as well as drilled and tapped for all the bolts in a machining center to ensure that each casting fit properly against each other. The center gridwork for each of the clock’s four faces was extruded from aluminum based on Americlock’s precise specifications. The glass for the clock faces was provided by Oldcastle BuildingEnvelope® with the largest piece weighing 150 lbs. and the smallest piece weighing 35 lbs. Even more impressive, more than 2 miles of gasket was used on the clock’s glass. 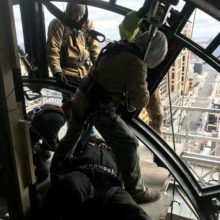 Despite freezing weather with temperatures reaching below 20 degrees Fahrenheit, Americlock was in Minneapolis for 5 months to complete work on the project. Each clock face weighed almost 12,000 lbs. In total, 4 coats of paint and 31,000 nuts, bolts, washers, and spacers were used in the project and all unsalvageable pieces of the clock were donated to local artists. From the site of Super Bowl LII, the clock can be seen lit up and restored to its former glory.